Because I am an art dealer, and because I have several art collectors that retain me as an advisor, I try to figure out the art scene from a commodity perspective as well as an artistic one; a key marriage often eschewed by most art critics because of their natural antipathy at admitting their symbiotic relationship with every facet of the art world, including the fact that art is everything, including a commodity. How long have I been shouting "buy Cuban art!"? A long time... and not just because I may be a prognosticating commercial art genius, but because of the two great recent examples in the worldwide industry of making a piece of art climb in price: Russia and China. Not just me, by the way, but also the Wall Street Journal, which looks at all things from a money perspective. And of course, being self-serving because I'd rather people buy the artwork produced by the artists that I represent, I am always glad when they continue to do well, as they are "discovered" by the greater American art public in these three forthcoming exhibitions, all featuring the work of Sandra Ramos, whose amazing work I've pushing for years now and whose American solo gallery debut took place at my former gallery several years ago! Sandra Ramos, "Alumbramiento (Enlightment)" - Mixed Media Etching. 22 in. x 30 in. (56 cm x 76 cm). 2005. The Lyman Allyn Art Museum in New London, Connecticut has just announced a new exhibition, Ajiaco: Stirrings of the Cuban Soul, opening September 12, 2009 and on view through February 21, 2010. Lyman Allyn Art Museum’s partner, the Hispanic Alliance of New London, has provided support for this exhibition with its coordinating programs and events. Cuban culture has been characterized as an ajiaco or a rich stew consisting of a vast array of ingredients. It is this synthesis that is the essence of Cuban art and the subject of Ajiaco: Stirrings of the Cuban Soul. The exhibition seeks to interpret the diverse social dimensions of Cuban art in a global context through the exploration of its relationship with African, Asian, European, and indigenous influences and belief systems. This art incorporates the tales of the Orisha of Africa, the calligraphy of Chinese Tao Te Ching, and the rituals of indigenous peoples. The formats change, the materials vary, but the mix remains constant in both Cuban and Cuban American art. 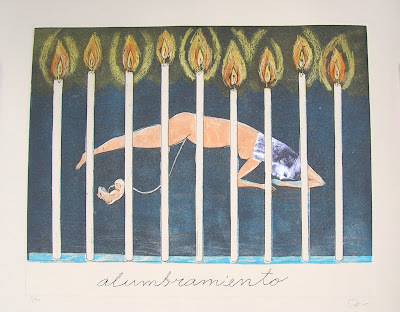 Ajiaco: Stirrings of the Cuban Soul is not only about Cuban art; it explores diaspora. In broader terms, this project addresses both the immigrant experience and the expression of cultural identity in a new place. Gelburd has been conducting research on Cuban art and artists for over fifteen years. She travels to Cuba regularly and has lectured there for the Havana Biennale, Havana University, and Casa Africa. Gelburd has received numerous grants and awards, including a Rockefeller Foundation grant to conduct research on Cuban art and she is publishing a book on Contemporary Cuban art. Her article “Cuba: The Art of Trading with the Enemy" was published in Art Journal in Spring 2009. This exhibition consists of more than fifty objects, including paintings, works on paper, photographs, sculpture, installations, and audio works by twenty-two artists. Ajiaco: Stirrings of the Cuban Soul will feature such major figures in Cuban art as Wifredo Lam, Manuel Mendive, Jose Bedia and Sandra Ramos, among others. Following its time on view in New London, Ajiaco: Stirrings of the Cuban Soul will travel to the Chelsea Art Museum in New York City and then on to the Hilliard Museum at the University of Louisiana in Lafayette, Louisiana. Norwalk, CT heralds in the fall with an exhibition of Latin American prints, September 24, 2009 through November 07, 2009. The exhibition opens with a gallery reception on Thursday, September 24, 2009, 4 – PM, and is free to the public. Entitled “Creative Dialogues: Latin American Prints & Printmakers”, the exhibition focuses on the human figure and the interaction of different Latin American cultures to their environment and living conditions. Approximately 50 works of art are in the exhibition. Gallery talks and a workshop exploring contemporary Caribbean and Latin American prints and printmakers are planned to coincide with Hispanic Month, which takes place in October 2009. Artists participating in the exhibition hale from many countries, and underscore the diversity of imagery presented at the exhibition. Gallery visitors will have the opportunity to review the work of two artists who create their images at a printmaking atelier in Cuba, images that are rarely exhibited in the United States; to review the work of Antonio Frasconi, an international artist who resides in Norwalk; or take in a lecture by Sandra Ramos, an internationally known installation artist, and Alicia Candiani, workshop owner and artist whose imagery emphasizes women and women’s issues. Sandra Ramos and Alicia Candiani are traveling stateside to create new prints at the CCP Helen Frankenthaler Printmaking Cottage and participate in the Artist-In-Residence program for several weeks during the “Creative Dialogues” exhibition. On Friday, October 2, CCP is hosting a special gallery event, open to the public. Join guest Curator Ben Ortiz for a walk and talk of the “Creative Dialogues” exhibition at 6 PM, and listen to Sandra Ramos and Alicia Candiani talk about their images in the exhibition at 7 PM. Following the gallery talks, attendees will have the opportunity to view new works by Sandra Ramos and Alicia Candiani at the Helen Frankenthaler Printmaking Cottage. And lastly, Wake Forest University is presenting "Cuban Artists, Books and Prints, 1985-2008." The exhibition gathers over 120 books, maquettes for unpublished projects, related prints, and printed objects. The books were designed for Ediciones Vigía, a collaborative artists’ press founded in 1985 in Matanzas. The only press of its kind in Cuba or perhaps anywhere, it began with a mimeograph machine and a borrowed typewriter. The show includes 120 works (handmade books, prints, sculptures, film about artists, digital frames, and mixed media) and it is curated by Linda S. Howe, curator and Professor at Wake Forest University, in conjunction with Paul Bright, Assistant Director of WFU Fine Arts Gallery. Prints by Ibrahim Miranda and Sandra Ramos offer romantic, nostalgic views of the island or ironic interpretations of patriotism. Miranda superimposes fantastic beasts on old maps of Cuba. For her book Jabberwocky, Ramos mixes excerpts from Lewis Carroll’s text and John Tenniel’s images for Through the Looking Glass with her own on pages facing foldout mirrors (where they must be read). Other prints combine photographs of herself as a child with her illustrations of contemporary Cuban life, suggesting its fairytale quality, sardonically sketching the quotidian, and voicing her sense of loss. The exhibition goes from August 26 - October 6. And, remind me later to blog my mother's most excellent Ajiaco recipe!